The implementation of structural adhesives to join multi-material lightweight vehicle structures requires advanced computer aided engineering (CAE) and therefore thorough material characterization and model validation at the component level. Hot stamped, 1.2 and 1.8 mm thick ultra-high strength steel hat section channels were joined to form closed tubular structures using a two-part toughened epoxy adhesive applied to the flanges, with a bondline thickness of 0.007″ (0.178 mm). The joined tubes were tested under quasi-static loading in two configurations: three-point bending to load the adhesive in shear (Mode II) and axial crush resulting primarily in Mode I loading. Finite element models of the tests were developed using previously measured material properties for the adhesive implemented using cohesive zone elements. The three-point bending response included a linear loading regime followed by localized plastic deformation of the tube and finally abrupt failure of the adhesive joint between the hat sections at an average load of 34.0 kN for the 1.2 mm tubes and 78.8 kN for the 1.8 mm tubes. The axial crush response included an initial average peak force of 260 kN followed by a local folding or global deformation mode, leading to progressive separation of the adhesive joint and an average energy absorption of 8.45 kJ. 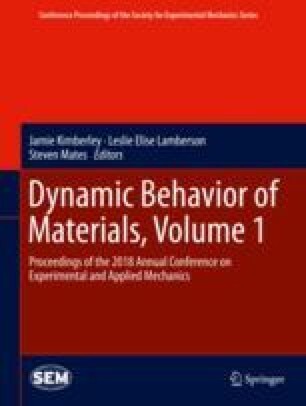 Finite element models based on published adhesive and metal properties demonstrated good correlation with experimental results in predicted peak force and overall loading response.